Our FAQ dashboard lets customer service agents answer tough questions fast. Top rated Customer service software offering financial grade security, intelligent skill routing, real-time CSAT scores and numerous automations. The most innovative live chat suite with numerous patents in the space such as Whisper Technology offering real-time monitoring and coaching of agents. Our Auto Translator gives agents the power to speak any language instantly. Your Customers Need Help. Right Now. There’s work to be done. Our tools make it easy. So quit just standing there. Time waits for no one. Some important features worth mentioning. Customers never wait when our Live Chat Support Suite does the talking. Now we're talking. Transform your agents with our complete set of seamlessly integrated help desk tools such as Live chat, Support Ticket, Knowledge base and CRM . Pssst... We offer custom fit help desk solutions for any kind of client. Is your customer service team overwhelmed or your Social Media strategy foundering? 24/7 Live Chat Coverage: Cost-effective pricing means you can use HelpSquad's highly trained and efficient live chat agents as an extension of your brand. Analytics: HelpSquad loves analytics so that you don’t have to. HelpSquad offers you easy-to-understand site data from Google Analytics, SEO updates, customer intelligence and heatmap reports. Wouldn’t you like to receive monthly feedback on the quality and quantity of your customer service with exact instructions on how to improve it? Now you can use gamification to do just that — with no added cost or work. 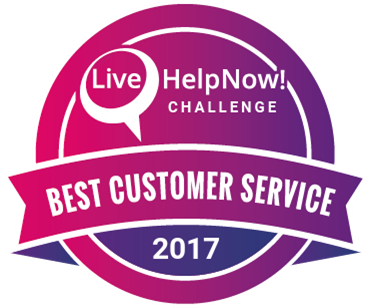 The LiveHelpNow Challenge compiles and pushes your real-world customer service results and feedback to your dashboard daily. Each month the Challenge ranks the top 100 companies providing excellent customer service. If your company ranks from a field of more than 10,000, you get bragging rights. Our agent challenge grades individual agents based on the same metrics so you can recognize the superstars on your team – and find out who needs more training. Believe it or not, live chat doesn’t have to be limited to a pop-up window on your website. Our software’s versatility will allow you to communicate with your customers across multiple mediums. If your prospects are on-the-go, they can chat with you via SMS/text message right from their mobile device. When they’re at the office, email might be the easiest way for your clients to reach you. You’ll be happy to know that our system will instantly convert your received emails into support tickets but that’s not all. LiveHelpNow software will open up additional avenues of communication via your customers’ favorite social media channels. That’s right! Your team will even be able to field direct message inquiries from Facebook and Twitter. LiveHelpNow’s help desk software is perfect for call centers of all sizes. Even if your call center represents more than one brand, there is no limit to the coverage our platform can provide. Your team will have the ability to create and customize unlimited chat portals, workflows, and supporting content all unique for each brand your call center supports. LiveHelpNow also provides intelligent skills-based routing so that incoming chats are assigned to the most suitable agents. Features like agent monitoring and whisper technology (US Patents Nos. 9,178,950 and 9,584,375) will allow supervisors to easily train and coach their staff in real-time. You won’t have to worry about hiring bilingual representatives either. LiveHelpNow’s cutting-edge software will give your operators the ability to instantly translate messages into any language. And don’t forget our real-time sentiment analysis. Our live chat system automatically monitors all conversations with an algorithm that has been formulated to count the number of positive and negative words exchanged between the operator and the customer. Your staff will be notified via email of any negative sentiment chats so your supervisors can immediately rectify even vaguely unpleasant exchanges. No customer left behind ever again! Need to assign special permissions to selected agents? Like running reports, changing knowledge base or canned response content, deleting data or managing other agents? No problem! LiveHelpNow offers vast user permission structure! Looking to increase the size of your team without actually having to increase the size of your team? Our intelligent chatbots can handle your support staffs’ frequently asked questions and offer solutions to common issues. This will enable your representatives will be able to focus on the complex customer inquiries that require the most attention. The best part is that the reduced chat load will make it feel like your staff has doubled, but for a fraction of the cost. How do our chatbots do it? Canned responses, that’s how! A canned response is a predetermined response to a frequently asked question. You can compose canned responses on any topic. For example, you can develop pre-written feedback for product and service descriptions, customer greetings, return policies, business hours, locations, and more! Still feeling skeptical? We already have a long list of clients that have benefited from the magic of our Intelligent Chat Bots. Check Mate Gaming was fielding upwards of 5,000 chats per day before they implemented our intelligent bot. LiveHelpNow's automated chat bot service reduced their online representatives conversations to 1,500 per day. And, guess what? Higher efficiency won't even be your biggest win. With LiveHelpNow’s chatbot, you are guaranteed to see an increase in leads, sales, and customer satisfaction. Take control of the experience your customers have on your website with Targeted Engagements. Targeted Engagements (a.k.a visitor triggers and automations) will allow you to interact with your online visitors in a way that will have the strongest impact. Our system will assess users’ attributes, so you will have the opportunity to appeal directly to their interests. These engagements can come in the form of chat invitations, banner announcements, coupons, or special offers. The best part is that the nature of the content can be pre-determined by you and your staff. Your LiveHelpNow dashboard will contain an extensive list of pre-chat conditions for which you can create custom, targeted messages. The visitor trigger settings will then allow you to pre-plan the interactions that will display intuitively when your customers exhibit certain behaviors. For instance, a shopper that has taken a long pause on the shopping cart page may receive an automatic chat message that encourages purchase completion. This particular visitor may be presented with a 10% off promo code or offered navigational assistance. Targeted engagements can even be optimized to route your customers to the appropriate department. Visitors can be routed to certain representatives based on the webpage where they started their chat or by the details collected at the start of the chat. If you’d prefer, settings can also be configured so users can choose the department they speak with. The best sales relationships are a direct result of an open dialogue between the customer and the seller. Case and point: You won’t know what your clients’ needs are unless you ask them. LiveHelpNow’s Pre-Chat and Post-Chat(Support Ticket) Surveys will help your team identify what they are doing wrong, and more importantly, what they are doing right! Then you can utilize any collected insights and consumer feedback to optimize your customer service plan. Customizable surveys won’t just gauge your customers’ overall experience. They will also help to determine best practices, score the quality of your support, identify top performers, and rate your website’s usability. In addition, LiveHelpNow software also has the capability to track CSAT scores for email, SMS and social media communications. No matter the medium, all survey results will appear in your dashboard in real-time. Don’t like the 1-5 scale, and need Net Promoter Score (NPS) no problem! Want to get to know your online customers on a more personal level? Automated Tagging will add an extra layer of meaning to the data already captured. This will enable your staff will gain in-depth insight into your consumers’ needs. So, how does it work? Your LiveHelpNow helpdesk console will give your staff the ability to create tags and associate keywords with those tags. When a particular topic is identified by the software, the chat session or email support ticket will automatically be categorized with the appropriate label. Categorization can also be done manually by your staff. They will even be able to create color-coded tags so that trending customer service issues and questions can be quickly and easily identified. In addition, frequent client inquiries regarding certain products or policies can reveal pain points and allow you to make the appropriate improvements. Tagged chat sessions and email support tickets aren’t just about identifying common complaints either. During interactions, clients may also make suggestions and mention features they would like to see in the future. The gathered information can then serve as a resource for new service and product ideas. LiveHelpNow’s Conversion Tracking Tool will show you the outcome of every interaction and the catalyst for every conversion. Take the guesswork out of determining which marketing campaigns have the most impact. Know exactly which agents are your top performers. Not only will the software provide you with critical statistics and insights into visitor behavior, but it will also show you exactly how your leads are turning into sales. Obviously, the #1 benefit associated with conversion tracking is the ability to monitor successful sales transactions. What manager wouldn’t love that the best sales methods can be easily pinpointed and turned into best practices? However, your staff will also have the ability to run conversion reports that identify traffic trends and highlight helpful feedback. With these tools you will be able to evaluate how well your website performs in terms of free trial sign-ups, newsletter registrations, video views, and more! The best part is that installing LiveHelpNow conversion tracking on your website is totally hassle-free. No code, programming, or webmaster required. LiveHelpNow software also includes our state-of-the-art Enterprise Reporting. Our system is capable of generating reports on a wide range of variables including agent performance, website efficiency, visitor traffic, survey results, lead trends, inquiries by tag, and more! Below we have highlighted what we feel are some, but not all of our most useful reports. Want to start learning more about your client base? Our chat and support ticket tag statistics reports will give you an in-depth look at your business’s customer service trends. LiveHelpNow customer service system automatically tags chats and support tickets to associate them with certain topics and customer behaviors. Once your interactions are tagged, you will be able to generate reports that will allow you to view conversations organized by category. These reports are also interactive. So the days of wading through your entire communication history for valuable consumer insights are over. With a simple click you will be able to view the transcripts associated with each tag. Customer satisfaction surveys are one of the most important tools included with our live chat and support ticket systems. Not just because they have the capability to gauge the quality of your teams’ support in real-time, across multiple communication channels (i.e. website live chat, text messaging, email, social media interactions), but also because the information collected from post-inquiry surveys can be sorted into agent and rating specific reports. These reports are interactive as well, so any negative survey results can be pinpointed quickly and easily to the actual conversion between an agent and the customer! This allows your staff will be able to immediately review and resolve any issues. In addition, management will be able to determine which agents handled negative interactions and what specifically went wrong within each conversation. LiveHelpNow conversion reports will allow you to track which chat or email lead your customers to complete pre-established goals. Objectives don’t have to be just monetary either. Our reports can track any “goal” from free meeting sign-ups to video views and social media likes. The platform will also allow you to comb through chat transcripts and email inquiries and determine which interactions and marketing campaigns were met with the most success. If a customer fails to fill out a post-chat survey, that doesn’t mean that LiveHelpNow software won’t be able to alert you when a customer has had a lackluster experience. Chat Sentiment Reports will give your team an opportunity to pander to customers that otherwise may have fallen through the cracks. For example, maybe a customer isn’t completely happy with your service but chooses to forgo voicing their complaints to management. LiveHelpNow software is designed to hone in on any negative interactions within a chat. It then logs the incident into the system automatically. Not only will you be immediately notified of unfavorable exchanges, but you will also be able to run Sentiment Analysis Reports to pinpoint problem representatives and areas where your customer service needs improvement. One of the worst disasters a company can face is a data breach. No brand wants to develop a reputation for putting their customers' personal information at risk. That’s why LiveHelpNow has developed advanced security features that now serve as a cornerstone of our software. Until LiveHelpNow introduced the world to Secure Forms, it was impossible for businesses to collect confidential customer data via live chat or email. Our PCI and HIPAA compliant platform will give your staff the ability to safely gather sensitive personal, financial, and health information across these online communication channels. Finally, your company can easily receive loan applications, medical records, credit card information, and more. All worry free! We know what you’re thinking. All of that data has to get stored somewhere, right? Don’t sweat it. We thought of that too. LiveHelpNow help desk platform also has a purge schedule feature. If you don’t want us to host the data you’ve collected, you can have all transcripts, emails, forms, and any other customer data sent to a secure location of your choice. Then LiveHelpNow can be setup to automatically wipe any trace of the information from its system. Imagine SnapChat for customer service! Data disappears as soon as the conversion is concluded! We have even given our clients the ability to limit access to their LiveHelpNow account with IP Whitelisting. For extra security you can configure your helpdesk account to only be accessible by certain IP addresses. If you only want your staff to have access to the program at the office, you can restrict log-ins from other networks. You are in good company! LiveHelpNow is trusted by US Navy, US Army, US Coast Guard, Barracuda Networks, and Micron among other Fortune 100 and 500 companies which wouldn't take anything less than stellar security standards provided by LiveHelpNow help desk system. With our software, your team will always remain at the forefront of the customer service industry’s latest technological advancements. LiveHelpNow’s developers are constantly making updates and developing new features. More importantly, we have a reputation for delivering innovations to our clients in record time. We are always ready and listening to our users! In addition, LiveHelpNow is the only help desk platform on the market to offer Embedded Windows that do not use IFrames! To put it simply, you will be able to offer your customers the most valuable experience without compromising your website’s branding. You can turn an embedded window into a searchable directory of your knowledge-base articles or you can completely re-design your live chat window to match your company’s color scheme. The sky is the limit!